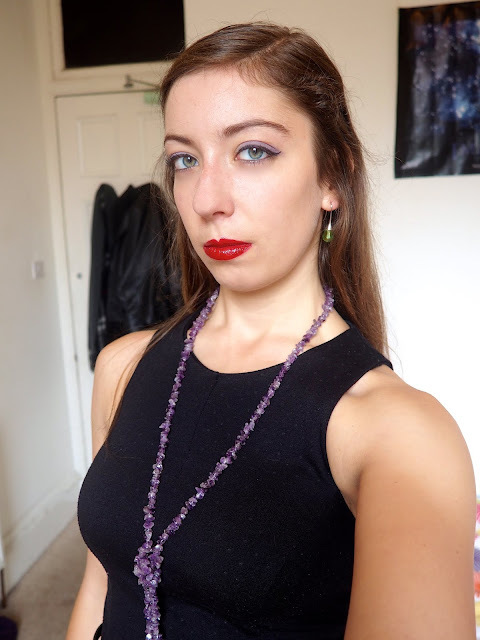 It's time for a villain for this week's Disneybound, and I was inspired by the iconic Maleficent, from 'Sleeping Beauty' - I already did a Briar Rose look here! Black is obviously the colour she wears most often, so I chose this simple little black dress, with the flared skirt and belted waist. She's a dramatic character too, so I thought high heels for some glamour were appropriate, and I added the cape-like cardigan, for a bit of flair, and to look like her robes. As her robes are lined with purple, I chose this chunky amethyst necklace, with green earrings to echo her ghoulish skin tone. I mimicked her makeup, with purple eyeshadow, winged liner, and bold red lipstick. My hair is modelled after the 2014 'Maleficent' film, where her hair is often loose, hanging long and straight and pinned back from her face - since I was never going to be able to find a way to recreate her horns!